If you’ve been in ministry or worked hard to build up your BEC, or even tried to grow in your own spiritual and prayer life, what I’m going to say would most likely resonate with you. It always seems that whenever we are able to take one step forward, we end up taking two steps backwards. It is one of the severest trials of our faith, to go on day after day in the same struggle against sin and self; experiencing failure and setbacks with every project we undertake, facing opposition, indifference and hostility from others who do not seem to share our passion. There doesn’t seem to be any growth or progress and we begin to doubt whether any progress has been made; and, what further compounds all these obstacles is that we do not see any striking proof of God’s presence or work. But is He? The parables today allow us to have a glimpse of how God works, often imperceptibly and in ways that are most humbling. The Lord, of course, is giving us a lesson on the kingdom and not one in horticulture. The Kingdom of God, just like the tiny mustard seed has humble and small beginnings but will eventually end up with great mega results. The growth of the Kingdom, just like the parable of the man who scatters in the dark of the night whilst everyone is asleep, will remain largely hidden and mysterious. The scale of its expanse and magnitude would only be apparent when one examines the final result. These parables present several important lessons that we should take to heart. The first lesson is that we should never despise nor overlook the significance of small things. The beginning of the Kingdom of God can be traced to humble beginnings. We are often tempted to believe that our ventures must be preceded by a great deal of groundwork and planning, massive promotions and advertisements, big rallies and spectacular shows. The Gospel Story did not begin in such manner. Our Lord was born in a humble manger among stable animals, with poor shepherds as His court retinue. His birth was not marked by dramatic accounts of the Son of God, being born in the most opulent palace of the wealthiest and most powerful monarch of the world. Great empires have crumbled, civilisations have become extinct but the Christian faith planted by the life, death and resurrection of this humble carpenter from an obscure part of the world would survive the test of time. Small and humble beginnings place the entire catalyst and mover of the narrative in the hands of God and not in the devices of man. The parables are stark reminders that the Work of God is often unobservable or incomprehensible. Just because we are unable to detect or perceive God working silently in the background, it does not mean that He is inactive or insensitive to our plight. We are often tempted to look for major signs and portents, immediate results and easy answers to our questions and prayers. When these are not forthcoming, we descend into frustration and anger, especially directed against God. But the Lord wants us to know that what is observable on the surface may not be an accurate measure of the final outcome. 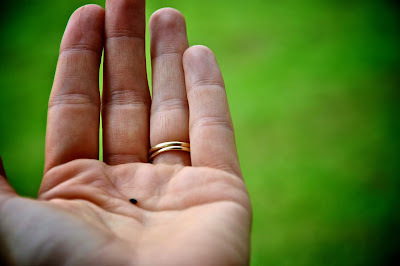 The story of the seed reminds us of the inner dynamism of the Kingdom, a God who is constantly and faithfully at work even when man ceases to work, even when we have chosen to give up, even when everyone else has chosen to abandon this enterprise. The third lesson is an important reminder that Christian life is ultimately eschatological. All things will become apparent at the end. The humble beginnings, the awkward and unplanned detours, the obstacles and setbacks, the disappointments and failures, the temporal success and victories do not mark the end of the story. What is definitive are the final fruits of the Kingdom which is not just a wild bet but a factual certainty – the harvest will come and the mustard seed will eventually grow into that large shady tree that will host all the array of heaven. This eschatological dimension reminds Christians that we must always live in hope despite our present difficulties. We may be tempted to give up and call it quits as all the odds seemed to be stacked against us. But then, there is the other reality – the hidden reality, the reality with humble beginnings but a cosmic-scaled ending. It is the reality of the Kingdom of God established by Christ's first coming and fully completed and realised at His Second. The themes contained in today’s parable are best illustrated in the beautiful prayer popularly attributed to the late Archbishop Oscar Romero. The real truth behind this prayer is that it was composed by Bishop Ken Untener of Saginaw, drafted for a homily by Card. John Dearden in Nov. 1979 for a celebration of departed priests. As a reflection on the anniversary of the martyrdom of Bishop Romero, Bishop Untener included in a reflection book a passage titled "The mystery of the Romero Prayer." The mystery is that the words of the prayer are attributed to Oscar Romero, but they were never spoken by him. Here I conclude with this prayer, which best summarises the parables we’ve just heard.